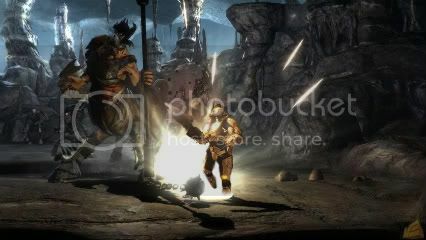 Home » Critical News » Master Chief hidden in God of War III? As you may know, the recent patch issued for PlayStation 3 exclusive God of War III fixed a glitch which allowed players to start a new game with all weapons and abilities intact. According to our source, it also papers over an Easter Egg snuck in by Santa Monica Studio – which Sony fear may have Microsoft reaching for the lawyers. First, you must have 100% of the trophies; the platinum is necessary in order to access the Easter Egg. If you have the platinum, then choose ‘New Game’ and the difficulty ‘Mortal’. As soon as the game starts – before you touch any buttons or either of the analogue sticks – pause the game, and go to the options menu. Press ‘X’ three times, and a new option of ‘Activate Master Mode’ appears. Select that, and the game will unpause… with a new, suspiciously recognisable avatar. All cut scenes are exactly the same, including Kratos; but your new character carries something that looks somewhat like a Plasma Sword (instead of the Blades of Exile) which is equipped with a special ‘Light of the Covenant’ attack (as seen in action above). Obviously an April Fool’s joke. Wack.